Radishes will be coming into season this month - I planted mine around Presidents' Day, along with the peas, but radishes only take about a month to mature! This is a lovely little dish for those who don't like the sharp bite of raw radishes. I never thought to cook them until I started getting tons of them in our CSA box, but it's a nice change. I love the combination of honey and black pepper, and you could also add fresh mint just before serving, a little later in the season. Preheat oven to 400° F. Trim, scrub and halve each radish (or leave them whole, just for fun). Steam 5 minutes, or until tender. Melt butter and honey with cinnamon and pepper in a small, shallow baking dish. 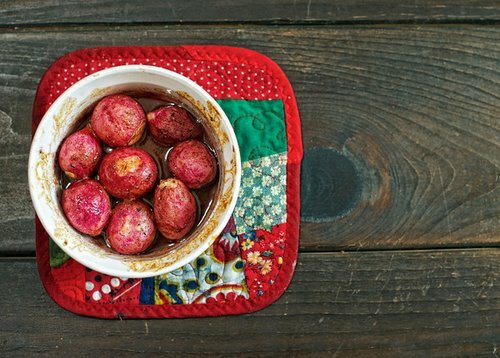 Toss the radishes in this glaze and arrange them in the dish. 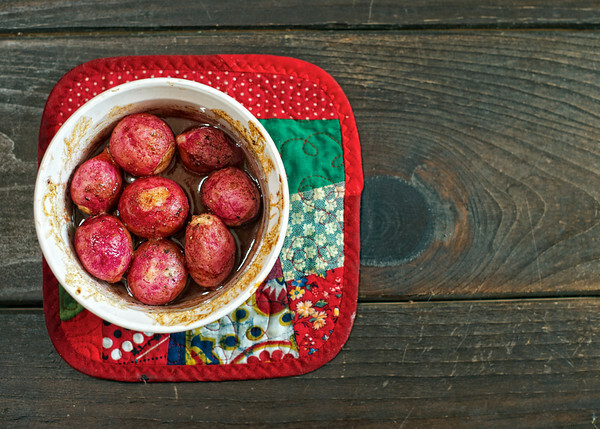 Bake until glaze is bubbling and radishes are slightly shriveled, 10 to 20 minutes. Toss with vinegar while still hot, and serve immediately. Alternatively, you could saute the radishes in butter for 5 to 10 minutes, then add the rest of the ingredients just before serving. Serves 4 as an appetizer or side.